This Saturday marks the grand opening of Richmond’s River Park Place and the grand prize giveaway of the 2013 Range Rover Evoque (don’t worry, there’s still time to enter the contest). Doors open on the anticipated event at noon sharp. Also exciting, developer Intracorp has announced that 2013 Miss Chinese Gloria Tang will be on hand to draw the winner of the luxury car at 2pm. But remember, in order to be eligible to win you have to be registered for River Park Place and be present at the time of the draw. Metro Vancouver home hunters are also encouraged to bring their appetites, as the Roaming Dragon food truck will be parked at the event site at 7100 Elmbridge Way in Richmond. River Park Place is a three-phase, three-tower development in the emerging Oval Village community. Onsite amenities include a fitness facility, multi-use indoor sports court, lobby lounge and meeting room, and an outdoor dining area with a barbecue and fire pit. 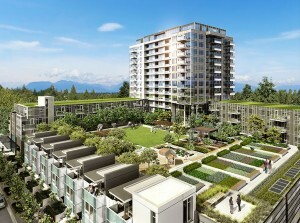 The development is also close to plenty of shops, restaurants and the Canada Line.